Looking for an alternative tour off the beaten path of the typical sightseeing in Budapest? I recently teamed up with BudapestFlow.com who offers a variety of small group tours. I was interested in several of his tours and decided to take his alternative tour of Budapest. TIP: Don't forget to look up! There are so many hidden gems in the city. Make sure you don't miss the little details that could be just right above you. Attila took us through the history about the Jewish District which is where all the cool ruin bars thrive. We started at the Mural of Sissi who was the Queen of Hungary. For as long as I've lived here I never put two and two together, is that area Erzsébet is named after her, hence the mural. Oh but don't mind that billboard at the bottom of the mural. The art board and the advertising board clearly don't communicate with each other. On the tour I also learned that street art in Budapest has to be approved by the government and are usually sponsored by different artist groups like Neopaint and Colorful City to name a few. If you look in the bottom corner of the street art you will be able to identify the artist, and the sponsors. We also walked past construction sites often next to some of the coolest murals. If a new complex is being built, often times the art work will be covered up by new construction, which is terribly sad. So look up, or you'll miss out! Don't get me wrong the tour wasn't just about street art. During the tour we slipped into a ruin bar, some cool designer shops, and a gallery. We even strolled through a cool book store called Massolit Books & Cafe. Tons of expats enjoy hanging out here as well. It was such a well rounded tour. I felt a little more familiar with this area, as I got an inside look into the community. To get a better idea of what this city has to offer, contact Budapest Flow and book your tour today. Attila is very knowledgeable about the artwork, the ruin pubs as well as the history of this city. The tour just seemed to fly by. I don't want to give it all away, so book your tour now and tell him I sent yah! 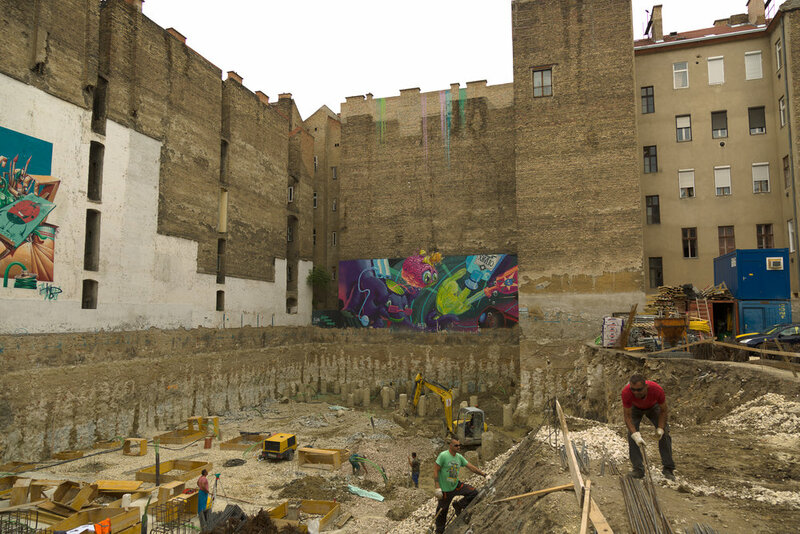 To see all of the street art of Budapest, check out this map. Ever explored the jewish district in Budapest? have you taken the time to see all the hidden gems in this area? Let me know in the comment box below.